NEW BEDFORD, Mass. — Southcoast Health today announced that Bob Unger, former editor and associate publisher at SouthCoast Media Group, has been named the recipient of the 2014 Southcoast Health – Hero for Health Award. 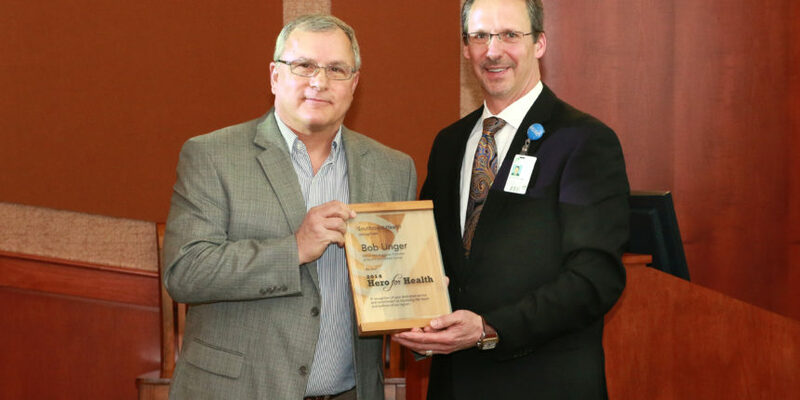 The Southcoast Health – Hero for Health Award is presented annually to an outstanding leader who exemplifies the mission of Southcoast Health by steadfastly fighting for and/or promoting the optimal health and wellness in our region, state and country. During Unger’s tenure as editor, the Standard-Times explored the turbulent changes in healthcare reform and advocated for the positive health and wellbeing of New Bedford and its surrounding communities. Unger and the newspaper took strong stands in favor of fluoridation to combat pediatric dental problems and public education and immigration reform; advocated for the Neediest Families Fund, implemented the Soup Bowl Supper fundraiser and raised awareness of nutrition and mental health concerns. Under Unger’s leadership, the Standard-Times received numerous awards including Newspaper of the Year in 2008, 2012 and 2013 by the New England Newspaper and Press Association (NENPA). As associate publisher Unger oversaw the daily newspaper, SouthCoastToday.com, five weekly newspapers and a monthly business magazine. On January 6, 2015, Unger voluntarily stepped down as associate publisher and editor of Southcoast Media Group due to the company’s tight financial situation. Prior to joining Southcoast Media Group, Unger served as Executive Editor & Vice President of the Centre Daily News and Managing Editor of the Doylestown Intelligencer in Pennsylvania. The Yale University alum also edited newspapers in Missouri and Illinois. Unger will be presented the award at a ceremony at the McBratney Amphitheatre at St. Luke’s Hospital in New Bedford on Friday, February 13, at 10 a.m.
Past recipients of the Southcoast Health – Hero for Health Award include former Congressman Barney Frank (2012) and State Representative Patricia Haddad (2013).